I been involved in market trading since ~1996 when I opened my first brokerage account. After some lousy steps with funds and stocks I been introduced to options trading by our mutual friend. The concept of markets fascinated me – it’s the game where all cards are opened [all information you want is generally available] and yet it’s the most complicated game in the history of mankind to succeed in. I wanted to study the methods and minds of the world’s most successful traders and was naturally guided to pick Jack Schwager’s series of “Market Wizards” books. I read his interviews with a pen, paper and bunch of bookmarks. I read these books probably 10 times – and each read was like a study for an exam. For each trader I highlighted the most important points, how he does everything, what his mind set is, what his education was, what was special about his life, how he started and how he defined and explained his own success. And of course how he picks securities, markets, stop points and all the good stuff I can squeeze from the information given by Jack’s books. Every successful trader defines his success in different terms. Every successful trader explains his success differently. Every successful trader has some “general” and some specific advice for others that sounds “ok” but has nothing to do with trading success. Every successful trader will likely to succeed in any security and in any market. And likely he will succeed in many other tasks as well unrelated to markets. On my quest for the ultimate answer on “what defines consistent success in trading” question – Jack’s books did not have one for me. I love these books and they were lots of fun to read and study, but I had to look elsewhere. Not a single successful trader sincerely had any a clue about what really makes him so successful. In other words they can’t give you an answer stated in words about the real cause of his own success. But take money away from the good trader and he’ll be back with a full slate in a while. Give a below average guy plenty of cash and every time he’ll consistently lose it. I had to step above and beyond tips, tricks, advices, approaches, “why/how” questions and anything “action” and “doing” -oriented. I had to step into the study of the human mind. Because that’s where I believed was a holy grail of an answer. Let say it – I was guided into study of intuition. Intuition is customary to girlie/feminine domain – at least that’s how society perceives it. Both men and women are intuitive yet men are trained themselves hard to not rely on anything non-scientific. Men tends to push for an answers, women tends to open for an answers. When I set myself on any quest I tend to blatantly ignore common concepts, opinions and views of others that are not helpful to achieve success. I seriously felt that answer to trading success lies in using own intuition. So what is intuition? It is defined as “knowing beyond the use of rational processes”. It’s knowing an answer through your inner self, inner being without having or relying on some authority, entity or source to actually give you an answer. The concept of intuition fascinated me. Could it be that ultimate answer? If that was it – then the one could just develop intuitive skills and use them to cut through the crap and just pick the winning trades and timing on the regular basis. Trading options (in which I was highly involved between 1997 and 2002) requires 3 factors to succeed – correct pick, timing and direction. Payoff with option trading potentially huge. Loss (for long positions) is quick and easy to define: -100%. I don’t want to get into short and exotic combos that could be more disastrous than 100% loss. My first intro and the best intuition study book was “Practical Intuition” by Laura Day. The book’s premise is that intuition is a facility of our body and mind and everyone (men and women) have it readily available and constantly on guard serving us. After all what else option trader could wish for but the answer on this simple question? I bought 2 notebooks and was diligently doing writings of all the intuitive exercises. It was fun to discover the amazing ways to ask a question (any question) and get an answer. It was fun to learn about how my own system (that is mind and mind/body connections) operates. Practical Intuition book opened lots of new perspectives to me about myself. You have to have a mind opened and your big boy’s ego turned off to learn this stuff (that is if you’re boy with a big ego). I found that so many people are in tune with their own intuitive selves without understanding, realizing, or defining this facility in any terms. In fact many who are connected actually denying intuition as anything of value or of existence. “I just felt it was the time for me to sell my huge position” – that’s how it works. There is more to it of course. That explained (I think i felt that it really does) the confusion I had about every successful trader that defined the root of his market success in totally different terms. Intuitive guidance in below and above everything you “think” that mattered. It ultimately the mind impulse and body’s action that pulls the trigger. You may bubble about your “winning system” as much as you want. But it’s your intuition that helps you to succeed (if you’re in touch with it) and it’s your habitual thinking and emotions that blows up your trading account. My study gave me a deeper answer about the real cause of that magical impulse. 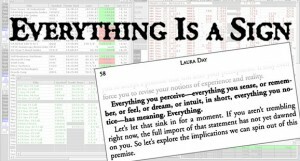 If above statement from Laura Day sounds like too metaphysical to you – it put more cash into my trading account that I ever thought possible. “pics of buildings”, “broken airplanes”, “falling meteor”, “910”. “…suddenly noticed absolutely clear image of a bear on the wall. The image was created by lights coming from the back side of the table lamp…”. I just kept learning, noticing and making records. You may laugh about that or whatever – but at that time i really sharpened my attention, focusing, feeling and interpretation skills. The image of an angry bear head with teeth literally painted by the table lamp lights quite scared me the first time I noticed it. At that day we had sharp disagreement with our babysitter and I thought it was a sign for me about some sort of harm that she could do to our kids. By monday morning I figured that it is possible that it was an answer to my question about the markets. Bear is a sign of down markets, isn’t it? So I decided to open pretty large long OEX Sep 530 PUTs position. As a reminder – OEX Index PUT option security appreciates greatly in price if market goes down. Once I opened this position and gave more thought about this for a while and decided that “if I think it is my intuition then i should add up more to my position”. 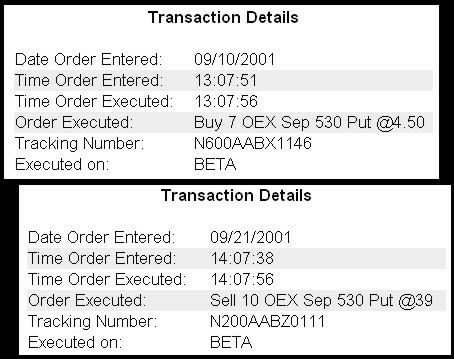 So i added up to the same security another pile of OEX Sep 2001 PUTs options from my second brokerage account, opening the biggest long option PUT position I ever had. I even added another record on Sep 10, 2001 that read: “be all you can be”. By the end of the monday Sep 10, 2001 my options position lost about 30% of it’s value because market somewhat tipped up a bit. I decided to keep it overnight to see what’s happen. The rest we pretty much know. The next day Sep 11/2001 terrorist attack happened, market was closed shortly after 9:30AM EST and remain closed for 1 week. Market reopened on the option expiration week and was free falling down every day until friday. On friday it started to show signs of recovery and I closed my deep ITM option PUT position on expiration friday at a market price of $39 (having purchased them at average price of $4.5). Now, let leave emotions and judgement apart and stick to the cold facts. What happened is – I asked a question and kept my mind opened for an answer. Answer did not come right away, although there were fragments of the answer that were coming in. When time was right – the answer came in. In fact today I may guarantee that every single person that was around Sep 11 attack received a number of intuitive signs in increasing strength. But people are so conditioned to ignore their own inner guidance and follow predefined routes and advices of “others” that most (99% probably) are ignoring this important part of our being completely. Intuition does not speak in words (at least not often). Intuitive guidance speaks (to you too!) mostly in signs and feelings. It answers you through the whole body of yours. Even if you shutdown part of your body – it will find another part that you still pay attention to and will deliver answers and guidance. What you need to do to benefit from it is to keep your mind perceptive and opened. And it is not a hard work – it could be fun. The biggest challenge in practical application of intuition in emotional games such as market trading – is learning to differentiate between emotional wishful thinking and intuitive guidance. I gathered quite a few important tips along this road and they proved to be extremely useful not only in trading but also in daily life. – Is this person good to do business with? – Does this offer sounds good or I’ll regret it later on? – Is this new restaurant dish is good or not so for me? – Is this my emotion or deep seated fears speaking or is it my intuition hinting me to the great new beginnings? With diligent practice I discovered more helpful aspects of how to differentiate between emotions and wishful thinking and intuitive guiding signs and intuitive information. I discovered important body/mind connection elements that helps to keep communication to our own inner guidance opened. That was a fun and productive way of self-study. I don’t really think it will ever be over! Having an ability to tune up to your inner intuitive self you’ll be able to get answers on any questions with precision that could be perfect for you. No other person, book or teacher will be able to do it better than yourself. No one else, no authority or guide will ever know when, how and what’s best for you than your own intuitive self. In relation to market trading – ability to tune up to your intuition will give you one of the most powerful weapon in your trading arsenal to sense market moves before it happens. If you really tune it up and really practice intuitive methods seriously – it could make you an “insider trader” for all securities that matters to you. And no one will put you in jail for that! Have fun with it, study it, practice it and profit from it!